US President Donald Trump has ordered the Department of Homeland Security to "step up" vetting measures, after a deadly truck attack in New York. 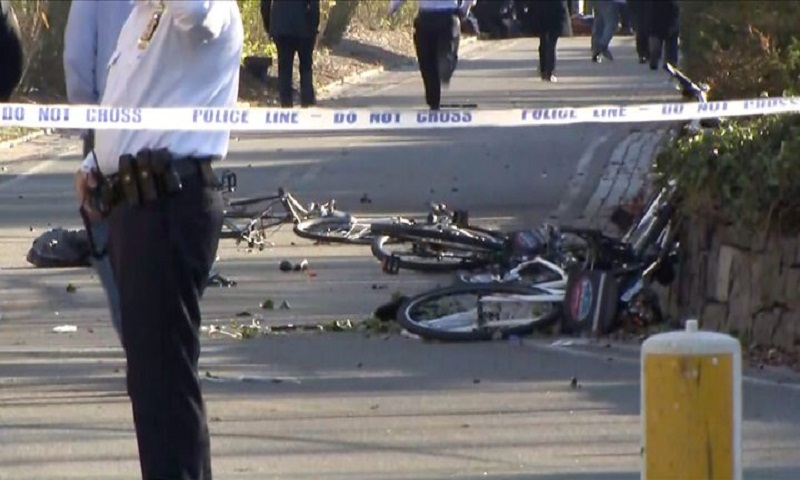 Eight people were killed and 11 injured when the driver of the truck hit people on a cycle path in Lower Manhattan. Five Argentines were among the dead. A 29-year-old man was shot by police as he left the car and detained. Media named him as Sayfullo Saipov, an Uzbek immigrant who came to the US in 2010. Officials said it was a terror attack. The suspect is now in a hospital. A note was found in the truck that referred to so-called Islamic State, law enforcement sources were quoted as saying by US media. Sayfullo Saipov had been arrested in Missouri last year over a traffic fine. How did US authorities respond? Police urged people to avoid the usually busy area as a major emergency services operation got under way. The suspect reportedly shouted "Allahu Akbar" ("God is great") as he left the truck. He was then shot and injured in the stomach by a police officer, the NYPD said. In a statement, the Argentine foreign ministry said five of those killed were from Argentina. It said the five men - all from the city of Rosario - were part of a group of friends celebrating the 30th anniversary of their graduation from a polytechnic school. Another member of the group was in hospital. He arrived to America from Uzbekistan in 2010 and is believed to be a legal resident in the country.